So have spent 2 nights with my new family. Where to start? Johnson (the country manager) organised an autorickshaw to take me from the hotel in Kovalam to the house I’m staying at nearby. When the rickshaw stopped for a moment to let a lorry pass (in one of the most ridiculously narrow streets I’ve seen in my life!) an old woman looked at me, pointed at me, and then gave the international thumb jerk gesture, loved by Peggy Mitchell meaning ‘Get outta my pub!’ (or in this case village). This aside, my family were extremely welcoming and have done everything they can to make sure that I feel at home. I have managed to secure a bodyguard in a local neighbour, Noyle, or Kevin Costner as he likes to be called. Noyle makes sure that I get to school ok in the mornings, walks me home and back again for lunch, and then home after school. He is 11. I get a LOT of attention walking through the village. Stares and shouts are common, (‘Valakari’ meaning ‘white woman’), lots of cute little kids wanting to come and shake my hand and ask my name (and somewhat bizarrely the name of every member of my family – mother name? father name?) through to what Noyle labels the ‘big, bad boys’ who come and tell me I’m beautiful (natch). Whoever they are, Noyle has realised that by being my bodyguard he gets to partake in a certain secondary level of my fame, and he is willing to physically shove whoever necessary to make sure that no-one walks by me but him. The only exception to this rule is Varsha, his sister. She is one of the best English speakers in the village and only 13. She has been moved up at school in fact by a couple of years and is always just a yell away if anyone needs anything translating. She has also volunteered to come to Pothys, the local department store, to come and help me buy some proper Indian dress. I have already been asked 4 or 5 times, rather pointedly, “Are you going to wear THAT to school?” I’ve also been given a hair clip, clearly so I can do something about the state of that, and I’m pretty sure they’re cooking up some plans to bling me up. So far evenings have been spent with Noyle, Varsha and any other cousins, neighbours, friends who turn up (the house is constantly full of guests wandering in and out) playing cards and my teeny, tiny travel Connect 4. So far; unbeaten. Come on the Brits! To read the rest of Olivia’s blog, click here. 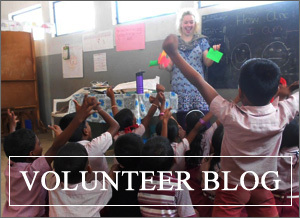 Interested in volunteering in India? Apply now!